The Minnesota Vikings have signed former Los Angeles Rams quarterback Sean Mannion and ex-Denver Broncos wide receiver Jordan Taylor. Mannion will likely replace Trevor Siemian, who joined the New York Jets, as the primary backup to Kirk Cousins. Kyle Sloter will also be in the second-string mix. The Minnesota Vikings signed former Los Angeles Rams quarterback Sean Mannion and former Denver Broncos wide receiver Jordan Taylor on Monday. The team also announced that a pair of restricted free agents, safety Anthony Harris and offensive tackle Rashod Hill, had both signed their tenders. Mannion, who turns 27 later this month, was the Rams&apos; third-round pick in 2015 and has appeared in 10 career games with one start. The Minnesota Vikings and wide receiver Adam Thielen have agreed in principle to a four-year contract extension valued at $64 million. The Vikings announced the deal on Friday. Thielen&apos;s agency, The Institute for Athletes, posted the terms on Instagram , including the potential through incentives to earn as much as $73 million over the life of the contract covering the 2021-24 seasons. One of the Minnesota Vikings&apos; greatest success stories is staying with his hometown team. 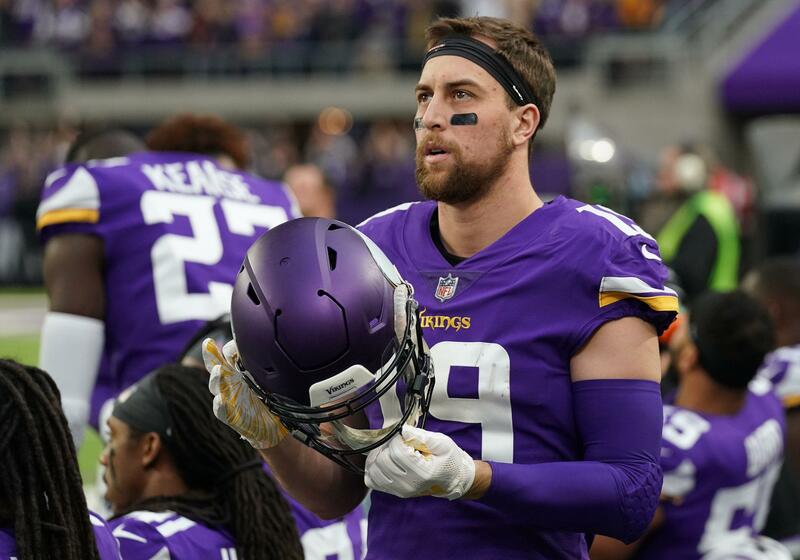 Vikings receiver Adam Thielen has agreed to a four-year, $64 million extension with the team, his agency announced through Instagram on Friday. The Minnesota Vikings will host former Salt Lake Stallions linebacker Greer Martini for a workout on Wednesday, per Rob Demovsky of ESPN.com. Martini tied for fifth in the AAF this season with 55 tackles for the Stallions. Martini spent part of last season on the practice squad of the Green Bay Packers after signing with the team as an undrafted free agent out of the University of Notre Dame. Minnesota Vikings cornerback Holton Hill has been suspended for the first four games of the 2019 season for violating the NFL policy on performance-enhancing substances, the league announced Friday. Hill will be allowed to participate in all offseason activities as well as preseason practices and games. Hill, 22, had 36 tackles and one interception in 16 games (three starts) last season as an undrafted rookie. Basketball fans have lined up early for the first entry into U.S. Bank Stadium, as the Final Four teams hold open-to-the-public workouts. Auburn takes the court first, followed by Virginia, Texas Tech and Michigan State. According to secondary market ticket seller StubHub, as of Friday morning, the lowest price for the semifinal games on Saturday evening is $385.